The Mediterranean wine region of Penedès, located just south of Barcelona, is most famous for its traditional method sparkling Cavas (Like Codorniu and Freixenet) and rich, velvety reds (Miguel Torres and Jean Leon being the most famous estates for red). Penedès also produces Rosados (rosé wines), some of the best in Spain in fact (apart from Navarra). White wines have never traditionally made the Penedès famous. In the last few years, though, many wineries have been launching superb, clean, fruity wines made with the region’s indigenous white grape varietals (Xarel.lo, Parellada and Macabeu) and often blended with international grape varietals such as Chardonnay, Sauvignon Blanc and Gewurztraminer. Some of the best white wines of the Penedès would include: Albet I Noya’s “Xarel.lo Anyada”, “Fransola” from Miguel Torres, Cava Gramona’s “Barrel Fermented Chardonnay”, Colet’s single varietal “Xarel.lo” and the lovely “Preludi” made by Raventos (with the three cava grapes (Xarel.lo, Parellada and Macabeu). 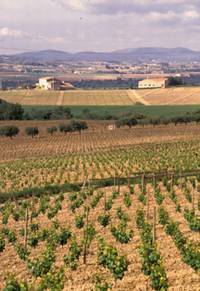 The white wines of the Penedès are extremely different to the whites from the Rueda or Rias Baixas. The whites from the Mediterranean almost have a tangy, salty sea air taste to them, delicious when paired with seafood. The whites from Rueda are extremely fruity, full flavored and grassy, while the whites from Rias Baixas are soft, muted and peachy. Fransola, the super wine made with Sauvignon Blanc by Miguel Torres, would pair perfectly with a goat’s cheese tart. The single varietal Xarel.lo made by Colet, would go sublimely with lightly grilled monkfish.